DIRECTIONS: From NY Route 3 in Vermontville turn onto the Cold Brook road until you intersect with Fletcher Farm Road to Franklin Falls Road. Turn right onto the Franklin Falls Road, continuing until you reach the Franklin Falls Bridge. Turn left at the bridge. 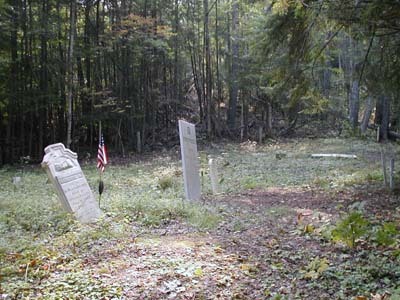 The cemetery is .6 miles from the bridge on a logging road on the right hand side of the road. This cemetery was compiled April 24, 1976 by a member of the Saranac Lake Genealogical & Historical Society and entered by Ralph W. Bennett. It was verified and photographed 8 September 2001 by Joyce Ranieri & Dorothy Horan. This cemetery is abandoned but is being maintained by students from Paul Smith's College. "She lived beloved and died lamented"
When Christ shall call me to appear." A member of Harris Light Cavalry Co. M. N.Y. Vol. My thoughts from rememberance of you. Freeman H. Son of D. M. & J. HATHAWAY Died July 29, 1864 AE 4 y'rs 13 Days. Daniel H. Son of D. M. & J. HATHWAY Died June 26, 1860 AE 2 y'rs. 11 ms. & 29 Days. for of such is the Kingdom of Heaven"
THUSA Wife of CALEB SMITH & Eldest Daughter of John & Lucy STEARNS Died June 30, 1854 In the 22 Year of her Age. Thy savior called thee home.